Mambakofi 1 gas discovery in the onshore Ruvu Basin, Tanzania. 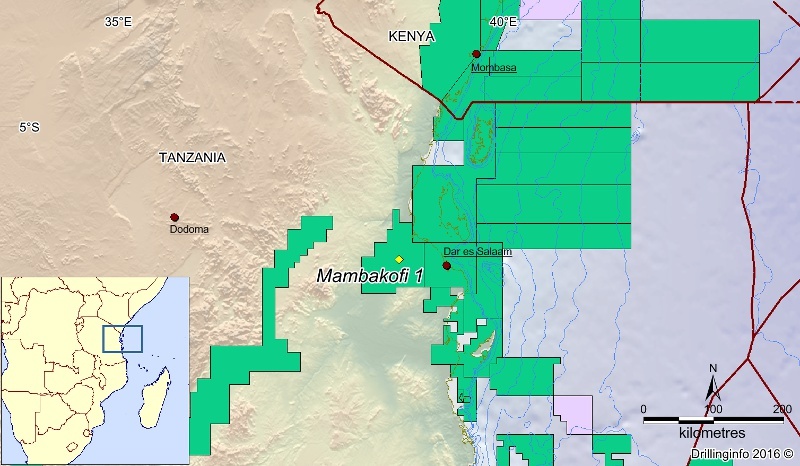 Although originally discovered in April 2015, recent investigations of the Mambakofi 1 gas discovery in the onshore Ruvu Basin in Tanzania have shown it to be much larger than the 160 Bcfg initially announced. According to Dubai-based Dodsal, the operator, as a result of these tests prospective resources for the Ruvu Basin block, in which the well is located, are now put at 2.7 Tcfg, with a potential upside of 3.8 Tcf, making this the largest onshore discovery in the country. Further gas resources may be associated with Mtini 1, the second well to be drilled on the block, and the most recent one, Mbuyu 1, on the western side of the block, where a large, possibly tight, gas column was detected but not tested. Mambakofi was drilled to a TD of 3,000m and bottom-holed in the Triassic. The gas is reservoired in the Upper Cretaceous, and a number of good reservoirs are understood to have been found between 800 and 1,500m. The source rock is thought to be Upper Jurassic. The Mbuyu well is believed to have hit a new Triassic play. Unlike most of the other gas discoveries in Tanzania, which are offshore, these discoveries are only about 50 km from Dar es Salaam, which will make commercialization easier. It is reported that Dodsal has plans for “the implementation of an Early Production System to bring gas to market”, hoping to produce the first gas from the field as early as 2018. The company owns 50% of the 15,300 km2 license, which it obtained in 2007, with state-owned Tanzania Petroleum Development Corporation owning the other half. Iran holds about a tenth of the world’s proven reserves of oil and 16% of the gas, and is the fifth largest oil exporter. Here we review the country’s oil and gas fields and reservoirs, particularly in the prolific south-west. Buoyed by new thinking and a high oil price, the industry readies itself to once again take on the technical, environmental and financial challenges of operating on the frontier Atlantic margin.